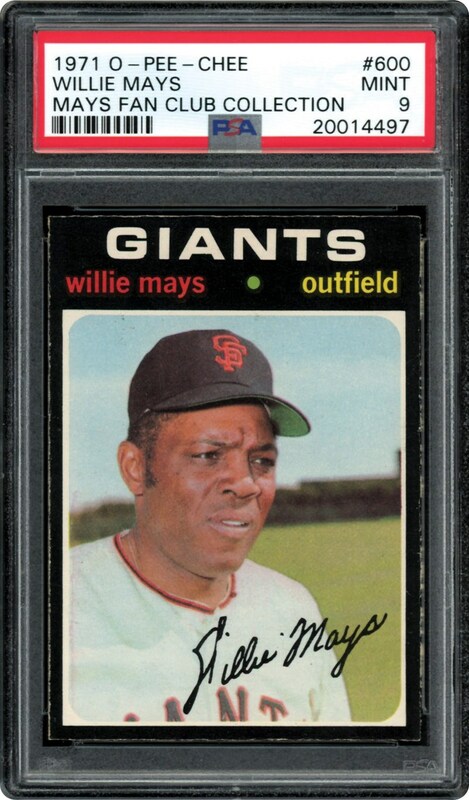 Lot # 356: 1971 O-Pee-Chee #600 Willie Mays (PSA Mint 9) - “1 of 3”; HIGHEST GRADED Example! 1971 O-Pee-Chee #600 Willie Mays (PSA Mint 9) - "1 of 3"; HIGHEST GRADED Example! Along with the 1962 wood-grain bordered issue, the 1971 Topps and O-Pee-Chee sets reside as the most condition sensitive compilation ever distributed by any manufacturer. Simply stated, due to their easily flaking black-borders, it is an excruciating task to find 'Mint" examples for any of these subjects. 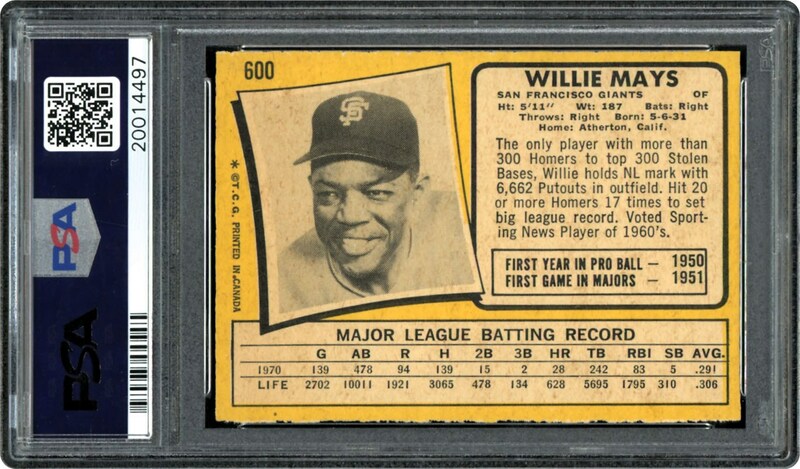 With that in mind, presented here is one of the most amazing Willie Mays cards extant, a breathtaking PSA Mint 9 specimen that along with a meager 2 other examples resides as the finest of its kind! Sporting one of the finest set of black borders for any 1971 O-Pee-Chee or Topps subjects, had it not been for some microscopic-like touching along some of the outermost edges, this miraculous keepsake just might be claiming bragging rights as the SOLE "Gem Mint 10" 1971 Mays O-Pee-Chee subject. Every other technical aspect is synonymous with near-perfection including image quality, fine centering, pristine surface gloss, pinpoint corners, and print resolution. The 1971 campaign would see Mays post his final "double-digits" home run tally (18), with the "Say Hey Kid" entering the twilight of his iconic career. That said, why not celebrate the immortal legacy of Willie Mays by capturing this magnificent gem that offers unparalleled aesthetics to even the most meticulous collector!